These energy bars are a concentrated source of vitamins, minerals and protein. They are truly awesome because they taste great! 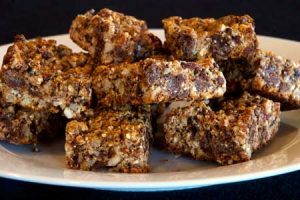 Awesome Energy Bars can be frozen for up to 3 months – make a big batch. Makes 20 to 30 bars. Preheat the oven to 350F. Lightly grease a 13 x 9-inch pan with a little canola oil or cooking spray. fragrant and starts to brown, remove it from the heat and set aside to cool. Transfer the mixture to the prepared baking pan and spread evenly. Bake for 20 minutes or until firmly set. Once cool enough to handle, cut into serving pieces and eat, or store in an airtight container at room temperature.